Swarna rice, also called Mansuri rice, is one of the healthiest varieties of rice. This is a short grain variety of rice- length of the grain is between 5.0 mm and 5.2 mm . 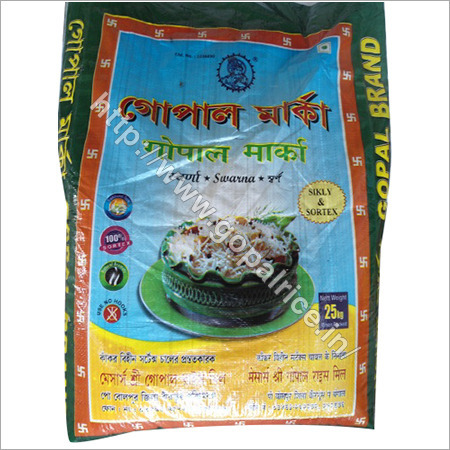 The natural aroma and nutrition of Swarna rice (non-Basmati rice) is maintained due to the HDPE packing done for our GOPAL brand. Being 99.99% impurity-free and with negligible moisture content, our Swarna rice is made from paddy acquired from various districts of West Bengal and Bihar. The color of the rice can be processed as per the customer's requirement. Swarna rice is available in 25 Kg packet and 50 Kg packet. Our parboiled Swarna rice is your trusted partner for each meal.